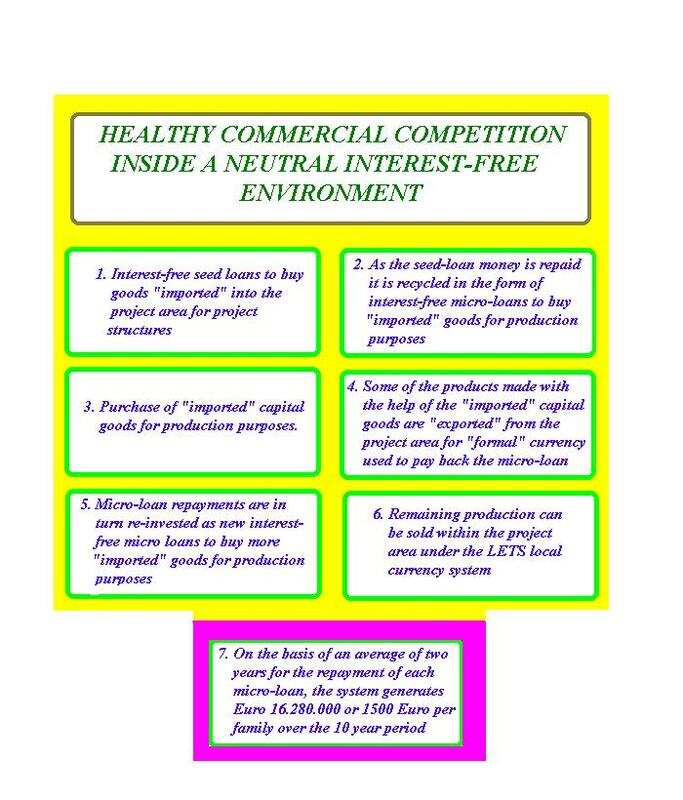 (iii) Multiple re-cycled interest-free micro-credits to be administered by a local micro-credit institution. 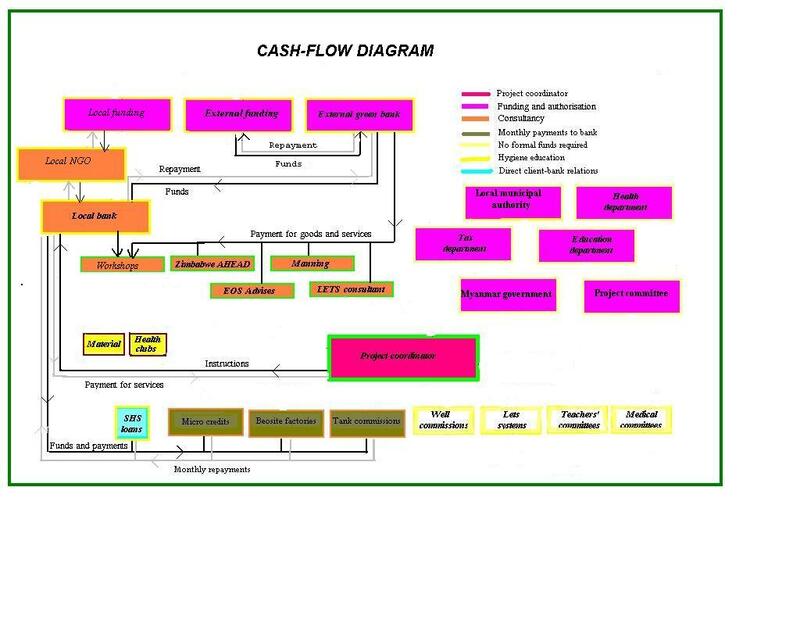 They are generated by recycling seed loan repayments and project reserves during the loan term, and by recycling repayments of the micro-credit loans themselves. One of the most important causes of poverty is on-going financial leakage from poor rural and urban areas and nations to richer national and international havens and nations. If poverty alleviation projects are to succeed, financial leakage from individual project areas has to be reduced and preferably stopped altogether. This does not imply closure of project areas to the outside world. It implies that the balance expressed in formal currency of transactions for goods and services imported into and exported from individual project areas must tend to zero. Some important factors causing financial leakage are energy imports, import of industrial goods and services, and interest. The cumulative interest content of a typical western industrial product is thought to be anything up to 40% of the cost to the end user. This interest normally exits from project areas never to return. Technologies using local energy such as human energy, local biomass, PV and wind energy, and locally recycled wastes together with appropriate financial instruments help create and encourage open competition and free enterprise within the framework of a cooperative and non profit-making global financial structure. 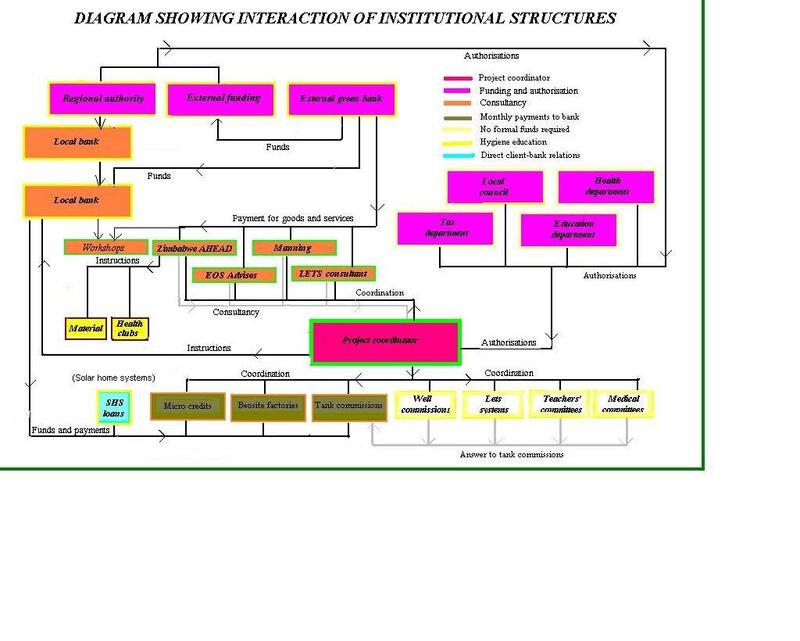 As the Model shows, self-financing integrated development is then able to flourish. Final repayments of blocks of micro-credits will be co-ordinated so that money for long term capital investment purposes (system replacement and extensions) will be available when it is needed. 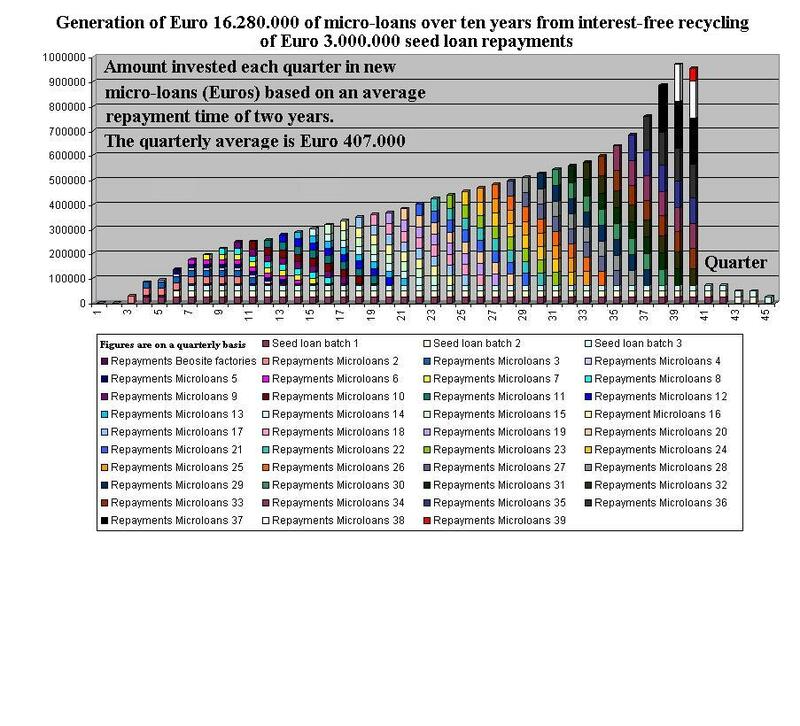 An example of this is shown in columns 37, 38, 39 and 40 of the chart in fig 2, where the higher columns indicate shorter payback times for the last lots of micro-loans so that the entire interest-free seed loan capital of Euro 3.000.000 is available for payment in the 41st quarter. The local micro-credit institution will charge a fee for each transaction to cover its costs and make a socially acceptable profit. The local bank's fee will be set before each project application becomes operative. However, the fee will be expressed in the local LETS currencies to stop financial leakage from the local economy. The bank will have special permission to accumulate LETS credits for this purpose. The bank may then use its LETS credits to purchase local goods and/or services available within the project area and sell them outside the project area for formal currency. Associated activities such as collection of payments and distribution of information will all be paid for in the local LETS currencies. 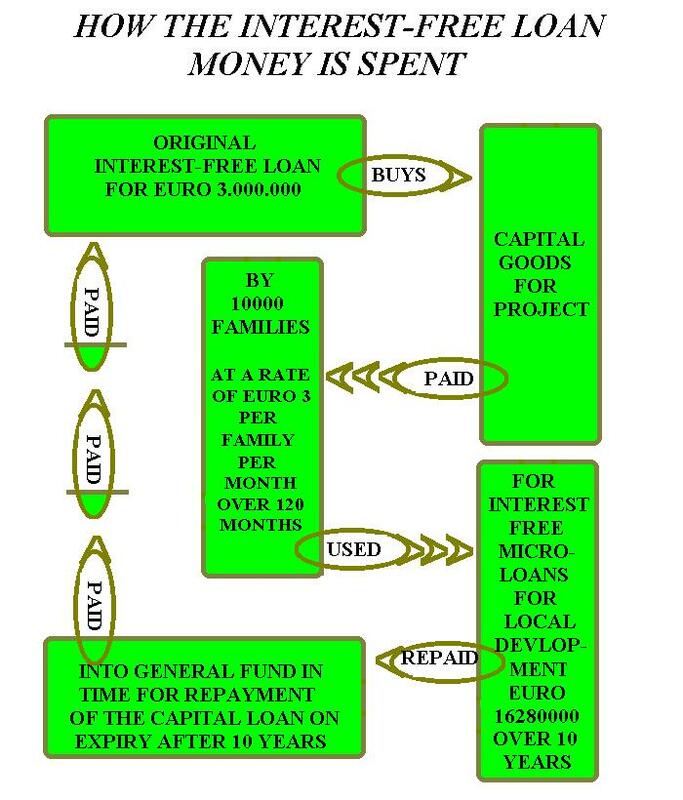 Local micro-credit institutions are, therefore, regular members of the local LETS systems. 2) The goods and services must benefit the general interests of the community and encourage exchanges under the local LETS systems. 3) Some of the goods and services must be saleable outside the LETS systems to earn formal currency to repay the micro-loans. 4) The Micro-Credit loans must promote the rapid circulation of formal money within the beneficiary communities. For example, using formal currency to build a clinic or hospital would not qualify for micro-credits because the capital invested cannot be re-circulated. 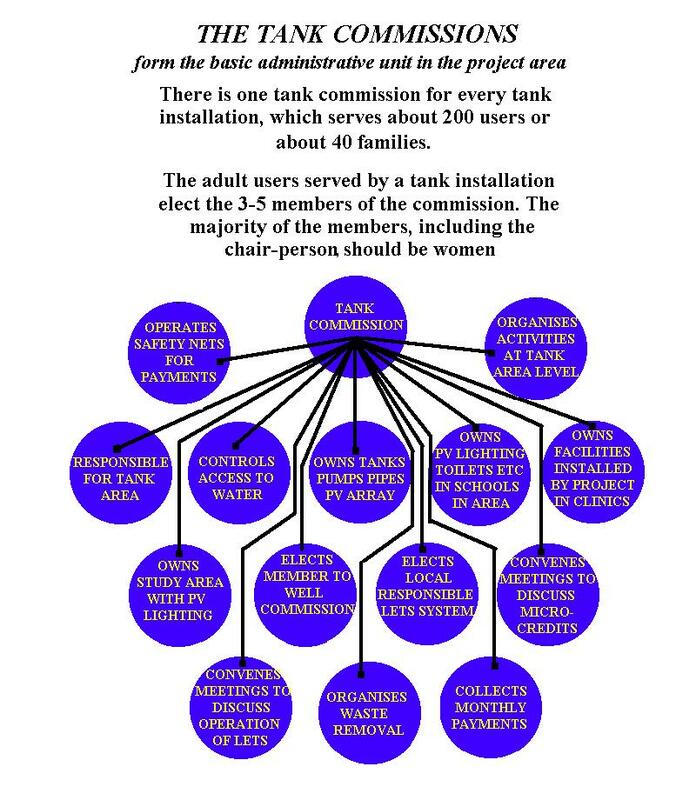 On the other hand, buying equipment for testing water quality (foreseen in the Model) would qualify, as the formal currency cost can be recovered by charging in formal currency for water analyses conducted for users outside the project area until the micro loan has been repaid. 5) Special priority will be given in the first instance to micro-loans to start the collection and transport of compost, urine, and grey water, and establish the recycling centres that will collect, store, and export non-organic waste products from the project area. The formal currency micro-loans will be recovered by sale of the waste outside the project areas. The following drawings and graphs form an integral part of this paper. Anhydrite, use of; Banks, role of in development; Gypsum composites products; Bio-mass, for cooking; Briquettes, bio-mass; Chain control, integral; CO2 emissions, reduction of; Compost, recycling; Composting toilets; Cookers, high efficiency; Cooperation, role in development; Development projects, structures for; Development, sustainable; Drinking water supply; Economy, developing countries; Economy, development projects; Economy, foreign aid; Economy, industrial development; Economy, interest-free development; Economy, Local Exchange Trading (LETS) systems; Economy, nominal local currencies, development of; Economy, micro credits; Economy, self-financed development; Economy, taxation and development; Education, hygiene; Gender, role of women; Gypsum, cheap; Hand pumps; Health Clubs, development projects; Hygiene, education; Industrial development; integral chain control; Integrated development projects; Interest, role of; LETS systems; Loans, interest-free; Local currency systems; Local Exchange Trading (LETS) systems; Materials, regeneration of; Micro-credit systems; Photovoltaic (PV) home systems; Photovoltaic (PV) lighting; Photovoltaic (PV) pumps; Photovoltaic (PV) refrigeration; Poverty alleviation; Pumps, solar; Pumps, hand ; Rainwater, harvesting; Recycling, compost; Recycling centres; Recycling, waste; Regeneration of materials; Rural water supply; Sanitation, developing countries; Sanitation, dry; Self-financing development projects; Solar pumps, submersible; Stoves, high efficiency; Sustainable development; Tanks, gypsum composites, local manufacture; Toilet facilities, gypsum composites; Toilets, dry; Urine disposal; Washing places; Waste collection systems; Water purification, UV; Water supply projects; Water supply, rural; Water tanks, gypsum composites, Women, role of in development.